Entomologist Dr. Charles Ray at the Alabama Cooperative Extension System in Auburn said he's aware of about 16 of what he described as "super-sized" nests in south Alabama. 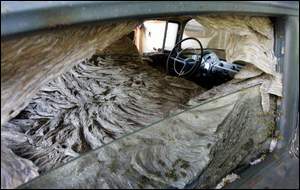 The largest nest Ray has inspected this year (shown above) filled the interior of a weathered 1955 Chevrolet parked in a rural Elmore County barn. That nest was about the size of a tire in the rear floor seven weeks ago, but quickly spread to fill the entire vehicle. Ray said he's seen 10 of them and cautioned people about going near them because of the yellow jacket's painful sting.